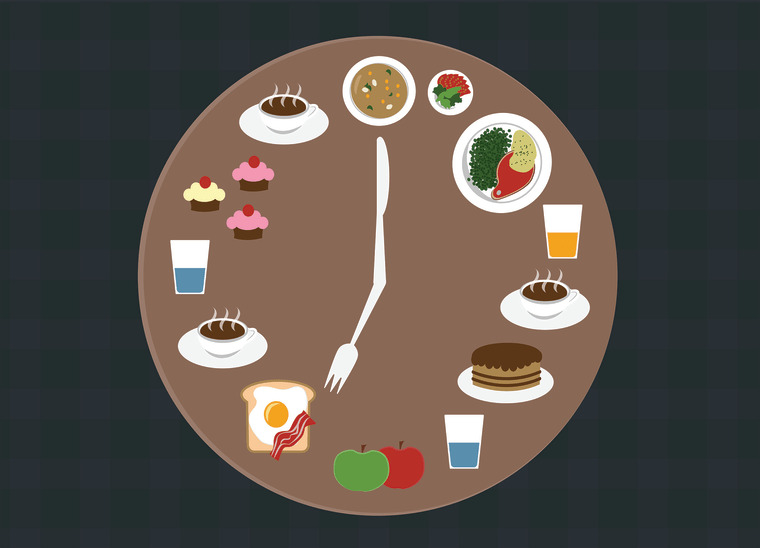 Meal timing and weight loss: Does it matter when you eat? Everyone knows that what you eat can impact your waistline and your overall health, but emerging research now suggests that when you eat can also play a role. As the saying goes, timing is everything. And when it comes to eating, aligning your meals with your natural circadian rhythm — the highly elaborate physiological system that coordinates your sleep-wake cycle and all the hormones and metabolic processes tied to that — may just help you function optimally and lead to many health improvements. The evidence suggests that our bodies may do best when we eat more in the morning than at night, a pattern that’s vastly different from how most Americans eat. Timing our meals this way may lead to better body weight, hormone regulation, blood sugar and cholesterol levels, sleep patterns and other metabolic improvements. The evidence indicates that our bodies do best when we eat more in the morning than at night, a pattern that’s vastly different from how most Americans eat. In one study that allowed participants the same number of daily calories, but compared the impact of front-loading 50 percent of those calories at breakfast versus the same number at dinner, those in the breakfast group fared significantly better. Bigger breakfast eaters experienced more than twice the amount of weight loss compared to the bigger dinner eaters, and at the end of the 12-week study, also experienced improvements in triglyceride levels and cholesterol levels. The breakfast group also had better insulin levels throughout the day. Taken together (and assuming these factors hold up over time) it would result in a significantly lower risk of health problems, like diabetes, metabolic syndrome and heart disease. What’s more, the group assigned to the bigger breakfast had fewer dropouts, suggesting that eating your biggest meal in the morning may be a more sustainable habit. Additional research may back up these findings. One small study looked at participants who were given an identical meal one week apart with the only difference being the timing of the meal (one in the morning and one in the evening). Again, the morning eaters came out ahead with improvements in blood glucose levels and a slight boost in metabolic rate. A more recent analysis adds more to the timing is everything case, showing that compared to eating a big dinner as Americans typically do, eating your largest meal in the morning can lead to better sleep patterns. In this small study, people in the morning meal camp fell asleep more easily and slept more routine hours. In other research, regular sleep times were linked to increased feelings of happiness, healthiness and calmness—in other words, better well-being. The research on time-restricted feeding — a form of intermittent fasting — is also promising. In a recent 10-week study, people who were instructed to both delay breakfast for 90 minutes and eat dinner 90 minutes earlier (thereby changing the timeframe in which they could eat), lost an average of twice as much body fat as those who were allowed to eat normally, despite being allowed to eat whatever they wanted during the approved hours. Though in this case, despite the impressive results, 57 percent of the participants whose eating was restricted felt the time window was impractical for the long haul. Can we draw conclusions on meal timing based on small, short-term studies? It’s hard to know whether results like this would hold up over the long haul or with more diverse populations (say, older, less healthy people, people of different backgrounds, etc.). And there are practical issues, too. Our work schedules and family obligations may make it difficult to get your biggest meal in the morning and cut off eating in the evening hours. It's interesting to consider how our typical eating patterns — light on breakfast (if eaten at all) with the biggest meal in the evening, coupled with our fast-paced lives (working and commuting long hours leading to late night meals and snacking) may lead to poorer health and weight outcomes. I’ve also seen a pattern of ultra-light morning and mid-day meals lead to insatiable hunger and cravings, and over-snacking on unhealthy fare, which causes trouble on its own. Certainly, it doesn’t appear that our bodies are designed to function at their best for the around-the-clock food culture we’re living in. In my experience, it’s good practice to give your body a chance to digest before bedtime by finishing your last meal or snack a few hours before you turn in. If your system is busy digesting late at night, it can disrupt the body processes that happen as we sleep, which may cause hormone disturbances and other imbalances that promote overeating and weight gain. Since your body needs about 10-12 hours to recalibrate, allowing it the time it needs is a smart call. Make sure you have a satisfying and balanced breakfast that provides sufficient protein (starting at 20 g), quality carbohydrates from fruit, beans, and/or whole grains and plant-based fats (such as seeds, nuts, or avocados). Eating breakfast helps reduce blood sugar spikes throughout the day and keeps your hunger hormones in check. And eating more in the morning and at lunch means you have a better chance of using that fuel as energy compared to eating the bulk of your food at night. When practical, keep dinner light and lean (ideas include grilled chicken or fish and a variety of veggies) and limit snacking after that. It’s reasonable to assume these habits will have a health payoff now and down the road.